When did you start your banking career? Kathy: I started as a teller when I was 20 years old. I came to Merchants Bank in 2008 as a File Clerk, and then moved to Loan Servicing and Credit Cards. What is your top banking tip? Kathy: I would say check your statements for fraud. We see credit card fraud daily. If you pay attention to your statements, either paper or online, you may be able to catch fraud in time. If you suspect fraud on your account, the window to act is within 60 days from the statement’s cut-off date. Acting as soon as you suspect something is always best. Or better yet, download our SecurLOCK mobile app on your mobile device to monitor your Merchants Credit Card daily. Many other cards have similar apps; take advantage of them to protect yourself. What’s one thing your mom or dad taught you about money? Kathy: My mom always said, “Put money away for a rainy day!” That’s such a “mom” thing to say, isn’t it? But you what? It was great advice. A little saved goes a long way later. If you had $1,875,000 what is one fun thing you’d do with the money? Kathy: I would travel to Europe and give some to family and friends. Besides money, what’s your favorite green thing? Kathy: It’s a toss-up between trees and avocados. If I had to pick, I’d say trees. Click here to learn more about Credit Cards at Merchants Bank. Credit cards are subject to credit approval. Minnesota and Wisconsin are known for cold winters. Just how cold? On January 9 and 10 of 1982, the wind chill was purported to be -71 degrees in Minnesota. That type of weather can be fatal to people and animals, and it really does a number on our homes, too. Most days aren’t nearly that cold, but many can get downright numbing. 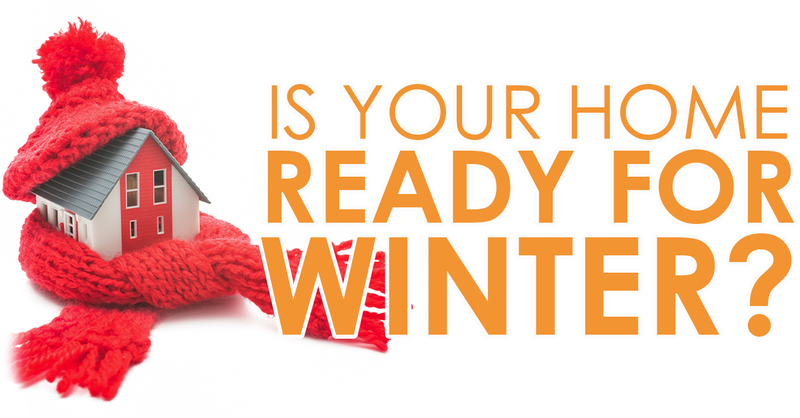 What can you do to prepare your home for this weather? We’ve compiled some of the best tips. As you go through these tips, remember that everyone has a different level of comfort in tackling home projects. Please consider hiring professionals whenever you believe it is necessary. Install a smoke detector and a battery-operated carbon monoxide detector near a fireplace, wood stove or portable heater. Vent all fuel-burning equipment outside. Examine wooden window frames for signs of rot or decay. Examine exposed ducts in the attic, basement, and crawl spaces. Use a sealant to plug up any leaks. Caulk and weather-strip doors and windows. Service snow-removal equipment. Sharpen ice chopper and inspect snow shovels. Trim overgrown branches back from the house and electrical wires to prevent them from causing a problem with ice or wind. Ensure rain or snow drains away from the house to avoid foundation problems. The dirt grade around the exterior of your home should slope away from the house. Remove and drain any attached hoses and store them for the winter. Shut off exterior faucets. Drain water from outdoor pipes, valves, and sprinkler heads to protect against pipe bursts. Make sure you have an ample supply of ice melt or sand on hand. Check the gutters and downspouts for proper fastening. Re-secure if loose or sagging. The weight of snow and ice can pull gutters off the house. Clean gutters of any debris. Make sure downspouts extend away from the house by at least 5 feet. Ensure all vents and openings are covered to prevent insects, birds, and rodents from getting inside to nest in a warm place. Have chimney and flue inspected. Check for missing, damaged or warped shingles. Have a professional replace them as necessary to prevent roof leaks. Check for deteriorated flashing at the chimney, walls, and skylights and around vent pipes. Seal joints where water could penetrate. Have a professional Inspect your furnace or heat pump to be sure the system is in good repair. Again, please consider hiring local professionals when needed, including clearing your driveway and sidewalks, if necessary. When the weather gets cold, take care of your pets. Bring them inside, or make sure they have adequate shelter and unfrozen water, if they are outdoors. If you need help financing any home repairs or projects, a Home Equity Line of Credit may be the answer. Contact your local Merchants Bank location today. Tips compiled from emergency.cdc.gov, bobvila.com and kiplinger.com. It’s difficult for everyone concerned when a closing is delayed. 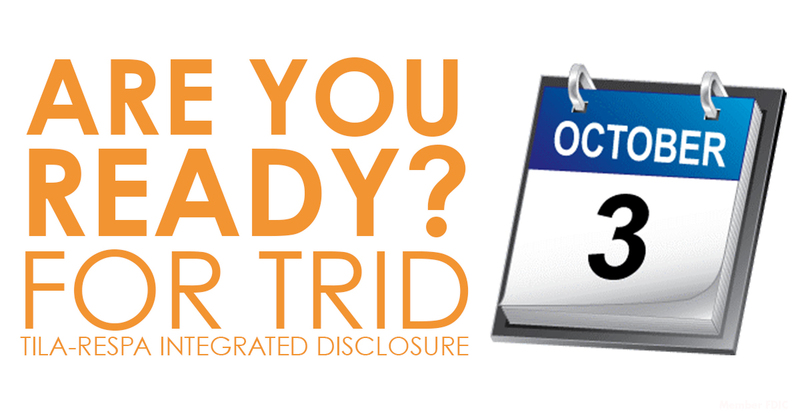 A new consideration has been added to the mix with the TILA-RESPA Integrated Disclosure (TRID) rules for mortgage applications submitted on or after October 3, 2015. The new Closing Disclosure has been put in place to add protection for customers by moving the Closing Disclosure timeframe from 24 hours to 3 business days, if hand-delivered, and 6 business days, if sent by mail. TRID rules will require the lender to give customers 3 to 6 more business days under certain change in circumstances to review the closing disclosure. The APR (Annual Percentage Rate) increases by more than 1/8 of a percent for fixed-rate loans and ¼ of a percent for adjustable rate loans. A decrease in APR will not require a new 3-day review. A prepayment penalty is added, making it more expensive to sell or refinance. The basic loan product changes, such as a switch from a fixed rate to an adjustable interest rate or to a loan with interest-only payments, or a switch in terms, for example, going from a 30-year mortgage to a 15-year mortgage. The Closing Disclosure must be delivered to the buyer/consumer at least 3 business days prior to the scheduled closing date. If by mail, the disclosure should be delivered/mailed 6 business days prior to the scheduled closing date. To meet the Closing Disclosure delivery requirements of 3 and 6 business days, mentioned above, the closing agent should get information to the lender 10 to 14 days prior to the closing date for completion of the Closing Disclosure. We suggest you communicate to the closing agent all your buyer paid charges, so the closing agent can comfortably get information to the lender. Plus, remember an additional 3 to 6 more business days may be needed, if a re-disclosure is triggered. The closing agent will need your real estate company’s state license number and your individual real estate number for the Closing Disclosure. Every file should contain the listing and selling agents name and phone number, contact information for the buyer and seller and the lender’s contact information. Keep in mind that depending on the agreement, the lender, not the closing agent, may be preparing and delivering the Closing Disclosure. Consider booking the actual closing date earlier in the process. This will help everyone in the process, encouraging everything to be completed in a timely manner. You can use the booked date to help prorate taxes, determining HOA (Homeowner’s Association) dues, calculating odd days’ interest and so on. Make sure any repairs that need to be completed and proof of the completion/re-inspection should be done prior to the closing. If applicable, well certificates need to be recorded. We suggest you solve this at the time the property is listed. Be clear on who is paying to record any well certificates. Study the new Closing Disclosure form/format so you are able to answer questions from buyers and sellers. The new rules could affect the dates you put in place. Make sure they are realistic. Please note, changes/adjustments that affect the value of the property may trigger additional disclosure and review periods. The laws are continually changing to protect your customers, and the information can be hard to digest. If you have questions, give me a call or send me an email. I’m here to help make the process as smooth as possible for you and your customers. I was at a community networking event one evening last week that included a group of upper-level College of Business students from Winona State University. “How hard is it to get a business loan?” they asked. Great question. One I get all the time. That depends. How hard is it going to be to pay it back? Not complex stuff, really, but far from easy in practice. For entrepreneurs looking to start a new business or experienced business owners looking to finance growth and expansion, there really has never been a better time to borrow money. Interest rates remain at historically-low levels. Most commercial banks have fully recovered from any credit problems lingering from the recent great recession. There is plenty of liquidity in the banking system, and banks are hungry to add good quality loans to the balance sheet. The fact is that commercial banks are in the business of making loans. The change in the regulatory environment that resulted from the recession has, perhaps, created some additional challenges but by in large solid borrowers will have choices in selecting a lender. The institutions serving the Seven Rivers Region, including Merchants Bank, are predominantly community banks and are eager to provide more loans to drive economic growth in our Main Street communities. So, with plenty of money supply to meet commercial credit demand, how should a business owner go about choosing the right banking partner? For us at Merchants, commercial banking is a relationship business. When we evaluate a loan request, we are diligent in our underwriting of the transaction itself. But, we are far less interested in the single piece of here-and-now business than we are in developing a complete understanding of the total operation and being able to deliver a full suite of business banking solutions that set up a business owner for long-term success. When I think about our best business customers, clients that immediately come to mind are those trusted relationships that have been shaped over years, even decades. I would like to think that these valued long-standing relationships are the result of one of our bankers starting with this end in mind way back when. When a commercial lender meets with a prospective new customer, the most important consideration ought to be, “how are we going to meet this customer’s needs … not only today… but well into the future.” In the same manner, it’s advisable for the business owner to be thinking in terms of finding a partner who can become a trusted advisor for the long haul. That type of relationship isn’t forged overnight, but there are behaviors that should be evident early on to warrant the level of trust that a business owner places in a banker. At Merchants Bank, we strive to deliver on that formula in meeting the needs of our business clients. Our bank locations are small enough where our staff can know the name of each person who walks through our door. At the same time, our strength with $1.5 billion in assets allows us to deliver to the market all of the resources required to meet the financing needs of virtually any business in southeastern Minnesota and west-central Wisconsin. It’s a beneficial combination for our business clients. I know every bank suggests it stands apart because of the personalized service it delivers and the quality of its bankers. Sometimes that’s true, but put your bank and banker to the test. Look closely at the expertise and passion of the employees. Are they responsive? Do they truly understand your business and your needs? Do they know what they are talking about? Do they care? Are they professional? Can they be trusted to say “no” when that answer truly serves your best interest and the interest of your business? There is a good deal that goes into commercial lending, and this really only touches the surface. For any business owner, having a banker that can meet those standards is probably more important than the pricing, terms and conditions of any loan package. If you’re looking for a successful formula, do your homework and find that kind of banker. Then, build a long-term relationship. Dawn: I started as a mortgage Lender with Altra in 2001. I was there for twelve years and then came to Merchants in 2013. What is your top tip for a first time home-buyer? Dawn: Get pre-approved first. Pre-approval helps you determine the maximum amount you can spend to purchase a home. You can also go over what to expect for monthly payments, down payments and other mortgage options with a lender at that time. It really gives you a clear picture of what you can afford and how that fits into what you’re comfortable with for your personal monthly budget. Dawn: The best thing they taught me is the importance of knowing your finances. Know what you can handle so that you are comfortable in your monthly budget. If you won the Powerball, what’s the first thing you would do? Dawn: I would travel all over Europe for an extended period of time, and explore all of the different countries. Dawn: The green of fresh trees on a mountain hike. What’s one lesson you learned when buying your own home? Dawn: Use a lender that is knowledge so they can guide you through the process. Buying a home should not cause a headache…it should be a smooth, pain-free process. Subject to credit approval. Contact Dawn today to start the application process for mortgage pre-approval. To find current mortgage rates and apply online, visit our website. Connie: Twenty-six years ago I started at Merchants in Winona as a Commercial Lending Assistant. I knew that I wanted to get into lending, so I switched and became a Customer Service Representative. I stayed in Customer Service for seven years and then became a Credit Analyst. During that time, I learned that I was the kind of person who wanted to be in front of customers. A few years later, the Consumer Lender position opened up and I’ve been here for ten years now. Before Merchants, I worked at a brewery in La Crosse…can you believe that? What one piece of advice would you give someone looking to apply for a HELOC? Connie: Make sure to check your credit rating. There are a few websites that allow you to download a free credit report and you can bring in the report and we can go through it together. It’s also helpful if you come with an idea of how much you want to borrow and then together we can determine how much equity you have in your home. Connie: To save, save, save. You do not buy anything until have saved for it. My parents were very frugal with their money and they passed that on to me and my two sisters. If you won the Powerball what’s the first thing you would do? Connie: I would buy a cabin up north. We love to be outdoors…just canoeing or spending time on the lake. It’s just an awesome way to relax and forget about everything. Connie: When I think of green, I think of Spring and the pretty trees and blooming flowers. If you could start a home remodeling project right now, what would it be and why? Connie: I want to change my bedroom because we don’t have a master bath. We’ve found out that when we have family visiting and we have to share the same bathroom it can become difficult. Contact Connie today to start the application process for your Home Equity Line of Credit. For more information on HELOC options at Merchants Bank, visit our website. 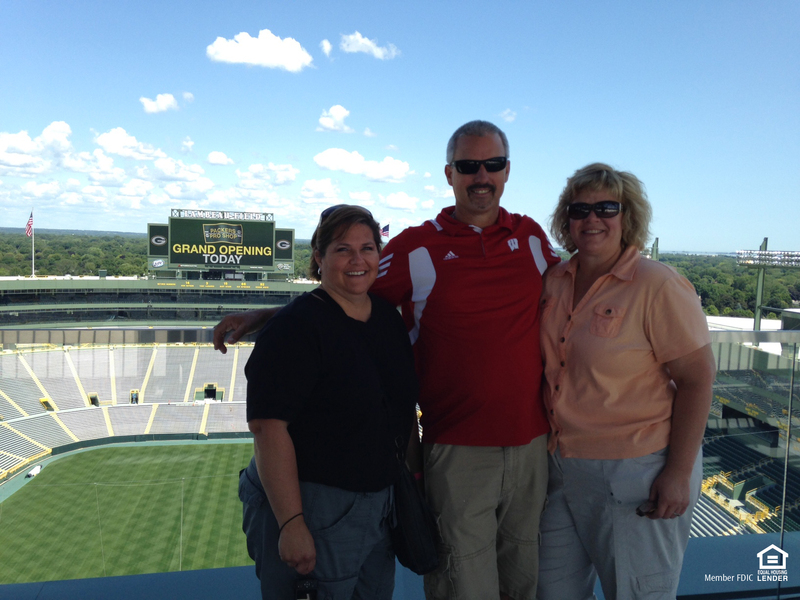 From l-r: Andrea’s friend, Linda; her husband, Jeff and Andrea take in Lambeau Field. Andrea: It will be thirty years this June. I have been very fortunate during my time here. I started at Merchants a floater, basically going between a few different departments like bookkeeping and proof. After that I was afforded the opportunity to learn several different positions, including being a Teller, working in our Loan Servicing Department and also as a Customer Service Representative. I’ve been in Consumer Lending for 25 years. This department has a lot of experience…we’ve all been all here a long time and have a great knowledge of several different departments. Andrea: Think about a HELOC as something that can meet your immediate and future needs. You need to have a longer term thought process in mind, because it’s a flexible product that has many possible uses. You may need a new roof this year, but will you have any house updates next year or the year after that? Do you have a child going to college in the near future? I believe our HELOC is one of the best products that we offer. If you’re disciplined in your borrowing, it’s an option that could make a lot of sense for you. Andrea: If you don’t have the money, you don’t buy it. They also taught me the Envelope Saving plan. It does work if you stick to it! Andrea: My husband and I have always wanted to do a “stadium tour.” Buy luxury RV and go with some friends around the country to different baseball or football stadiums. That would be fun. Andrea: The green turf of a football or baseball field. My husband and I have enjoyed many great memories of our kids on the field! Andrea: I would do a bathroom remodel. We’re limited in space and we only have one bathroom. I’d make our current bathroom larger and add on another where we could fit it. Contact Andrea today to start the application process for your Home Equity Line of Credit. For more information on HELOC options at Merchants Bank, visit our website.